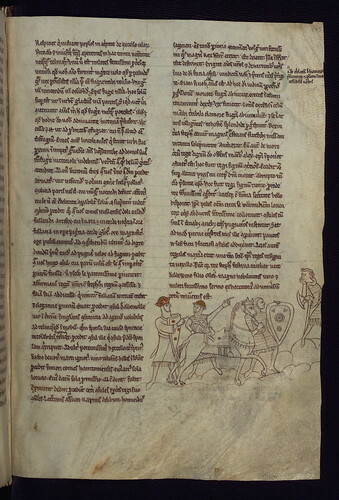 Henry of Huntingdon's Historia Anglorum, King Stephen directs Baldwin FitzGilbert to address the army before the Battle of Lincoln, Walters Manuscript W.793, fol. 105r, originally uploaded by Walters Art Museum Illuminated Manuscripts. Produced in the early thirteenth-century, this manuscript is an important textual witness to the Historia Anglorum, the History of the English People, by Henry, archdeacon of Huntingdon. The first version of Henry of Huntingdon’s text had a terminal date of 1129, though there were four more updates containing events through 1135, 1138, 1148 and 1154. Walters W.793 represents the fourth version, covering the events from Britain’s first leaders up to 1148, in which the number of books is increased from eight to ten and three letters by the author were added. The text contains several colored foliate initials, though it is especially notable for its line drawing of King Stephen (d. 1154), grandson of William the Conqueror, and his earls before the Battle of Lincoln on February 2, 1141 (fol. 105r). It is closely related to British Library Arundel MS 48, which is believed to have been the model from which Walters W.793 was copied. Both copies may have been based on a prototype extant during the life of Henry of Blois (d. 1171). Of the approximately three dozen surviving manuscripts copies of the Historia Anglorum, only eight pre-date W.793. It and Arundel 48 are the only known illustrated exemplars.